There Will Be Blood revolves around the early 20th century and the brutal world of oil mining that stars Daniel Day-Lewis in his Oscar winning role as Daniel Planview, an up and coming oil tycoon of the times. The film brings forth a plethora of human emotions as Daniel Planview is taken on a dark journey as he attempts to make his millions with no consideration for those that cross his path. At times, There Will Be Blood is historically accurate as it shows the savagery of the early oil days, however there are two true stars of the film which is the story itself and the amazing acting ability of Daniel Day-Lewis as we the viewer are taken into his inner psyche from caring foster father to twisted and deeply disturbed oil tycoon. Compared to the DVD version, There Will Be Blood is far superior on Blu-Ray that is definitely one of the most impressive non-CGI movies at present. The attention to detail is unsurpassed during certain scenes in the movie which compliments the colours and rich levels of black. As with the video quality, the sound is brilliant through our surround sound setup that is a true movie-esq experience. 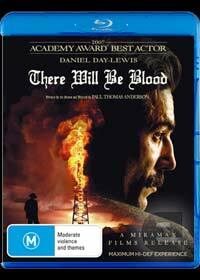 In conclusion, the Blu-Ray version of There Will Be Blood is easily the definitive version for the home viewer. The movie itself is brilliant which can be watched by a variety of people that is one of the most gripping movies that I have watched in some time. Daniel Day-Lewis truly immerses into the character of Daniel Planview and director Paul Thomas Anderson brilliantly links the entire movie together. Match that with some interesting special features from a documentary to an entertaining behind the scene snippet's and this nicely rounds out the DVD for those wishing to go beyond just the movie. Highly Recommended! 15 Minutes - Pics, Research, Etc., For the Making Of "There Will Be Blood"